Bad weather and high rentals are dampening the festive mood at this year's Festive Street Bazaar in Chinatown. The annual bazaar - spread out across Pagoda, Smith, Sago, Temple and Trengganu streets - opened last Friday and runs till Feb 7, the eve of Chinese New Year. Stall owners say the unpredictable showers in recent days have kept people away. In the past, wet spells have reportedly had the same effect, particularly in 2008 when businesses experienced a drastic dip of 70 per cent and more in sales due to the rain. Mr Justin Tan, 31, managing director of retail company Trendinsg, has set up shop at the bazaar for the fourth straight year, but says he is seeing his worst sales this year. His stall along Temple Street sells an assortment of products such as fashion accessories and mobile gadgets. Mr Tan says: "When I first set up in 2012, sales were good. But because of the economy slowing down over the years, business has been going from bad to worse. "And I think this year, we're seeing the worst weather conditions. Because of the rain, there was hardly anyone walking around." He says his business has dropped by about 30 per cent every year. Long-time stall owner Chow Siew Wah also notes the drop in the number of customers since he first set up shop at the bazaar in 1998. The 50-year-old, who has a stall at the bazaar every year, sells festive snacks such as preserved fruits and traditional candy. He says in Mandarin: "The crowd you see now is at least half the number 18 years ago. In the past, there were many tourists from Malaysia, Indonesia and China who came to Singapore to buy a lot of things. But now, you don't see them as often, so business has definitely worsened." He adds that his sales have tumbled by at least 50 per cent since 1998, but claims he has not increased prices over the years. All the other seven stall owners The Straits Times spoke to also complained of the weather affecting their businesses. Rising rentals are also adding to their woes. Mr Chow says he is currently shelling out slightly over $10,000 for two stalls in Temple Street. While this rental sum has remained constant for him in recent years, he points out that he had paid only $750 for one stall in 2002. Mr Tan says he paid $5,700 for his stall for the last three years, but is paying $8,000 this year. Mr Lim Gek Meng, 63, head of the Kreta Ayer-Kim Seng Citizens' Consultative Committee which organised the bazaar, tells The Straits Times that "stall rental prices are adjusted based on economic inflation and market demand". The Chinatown bazaar, a festive mainstay since 1989, became more popular when the number of stalls increased to a few hundred in 2004, Mr Lim adds. There are 440 stalls this year - the same number as last year. There were 480 stalls in 2014 and more than 500 in the few years before that. The committee hopes to draw one million visitors this year. Last year's bazaar saw 900,000 visitors. Ten per cent of the stalls are up for bids and bidding prices have sky- rocketed year on year. The rest of the stalls are usually allocated to existing businesses in Chinatown if they wish to have a stall at the bazaar. The highest bid this year is $13,000, up from $12,200 last year. Still, some stallholders remain hopeful, such as married couple Mariam Idd Makame and Ruel B. Laranjo, who run Shalom Orphans in Temple Street. They sell colourful leather pouches and intricate woven bags made by orphans and widows in Tanzania, East Africa. They could open their stall only on the second day of the bazaar because of the rain. This is the third year they have set up shop at the bazaar. Mr Laranjo, 44, says: "We try to participate in every festival here, such as Hari Raya and Deepavali, but we like the Chinese New Year bazaar best for its festive spirit." •The Festive Street Bazaar in Chinatown is on till Feb 7. Nonya kebayas imported from Surabaya, Indonesia, are gaining popularity among Singaporean Peranakans for festive occasions such as Chinese New Year and weddings. Offered in an array of bright colours, the intricately embroidered cotton kebayas are versatile and comfortable enough for everyday wear in Singapore's humid weather. The kebayas are priced from $60 to $120, while batik sarong skirts are $35 to $45. A full set of kebaya and sarong for children starts from $35. Batik shirts for adults go for $28 to $60 and those for children are $15 to $18. These miniature gardens (above) from local research and manufacturing company In Vitro supposedly attract good fengshui - they incorporate all five Chinese elements (wood, fire, earth, metal and water) - and double as air purifiers. Fitted with the Botanicaire airflow system created by a group of Nanyang Technological University researchers, these plant units are said to remove toxic gases and dust particles from the environment. Choose from Lucky Bamboo, Money Plant, Umbrella Tree and Devil's Ivy - all popular plants during the festive season. 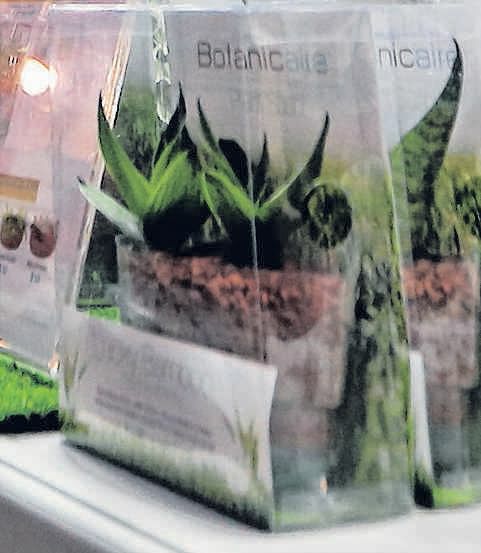 Individual miniature plants are priced from $10 to $25. These tiny colourful blooms (above) may look artificial, but they are a type of chrysanthemum that has been processed with a freezing technology to lock the moisture in. Imported from Japan, Freezy Flowers require minimal watering or care, and are perfect for spaces with low sunlight. They last up to 10 years, which is thought to symbolise longevity. 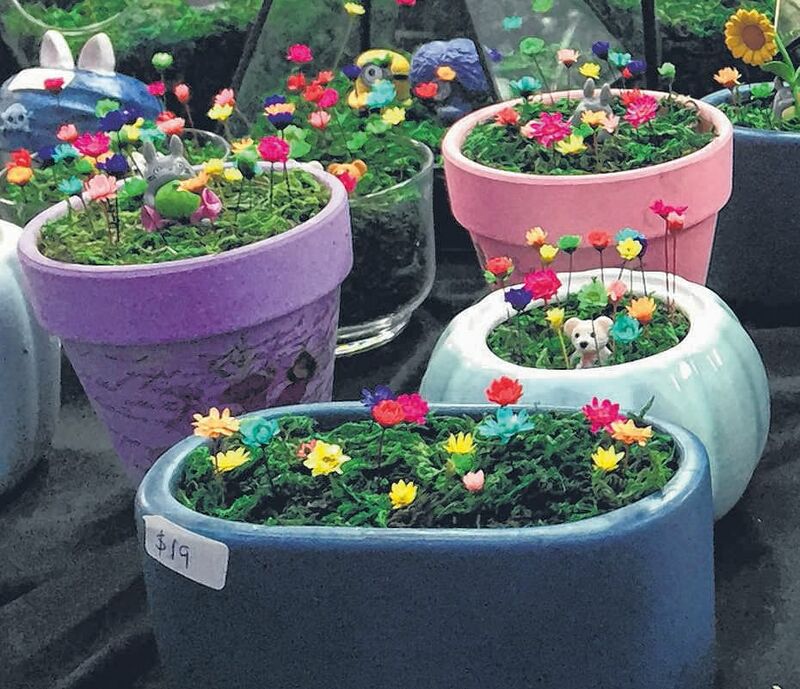 The flowers come in decorative pots of different sizes and larger terrariums, and cost $19 to $40. Traditional Chinese New Year snacks are aplenty in the bazaar, but you can add pops of colour into your festive goodies stash with offbeat offerings such as rose melon seeds. Imported from Taiwan by stall owner Ko Yu Quan, 25, rose melon seeds are among the bestsellers. Mr Ko's stall also offers black peanuts and red soil peanuts from Taiwan, assorted crackers and Indonesian snacks such as prawn rolls and samosas. Prices range from $2 for a pack of crackers to $10 for 500g of rose melon seeds.